IP Legal Services files both national and international trademark applications. The firm has filed numerous trademark applications with the US Patent and Trademark Office (U.S.PTO). An exemplary list of some of the registered, allowed and published trademarks filed through IP Legal Services is given here. First a trademark search is conducted to determine if there are any confusingly similar or conflicting marks that are already registered. If the trademark search is negative, IP Legal Services will file the trademark application in the U.S.PTO. A trademark application may be filed under Section 1(a) with a declaration that the mark is currently in commercial use or under section 1(b) with a declaration that the applicant intends to use the mark in commerce. 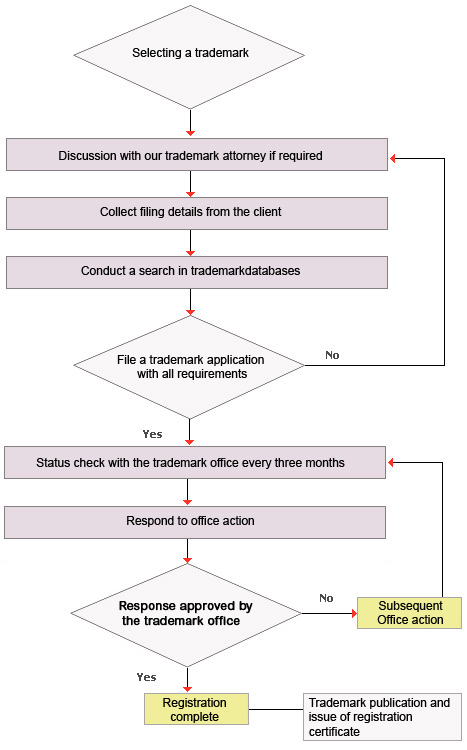 This provision gives the trademark applicant the option to file a trademark application prior to using the mark in commerce. However, the applicant must submit to the U.S.PTO a suitable specimen showing the mark in use in commerce before the registration of the mark. Contact us if you have any further questions. After the mark is filed, within a specified time period, a U.S.PTO trademark examiner will review the trademark application and issue an office action to the applicant allowing or refusing the trademark registration. The trademark office actions can reject the trademark based on the trademark being confusingly similar to a registered trademark or may identify deficiencies that the trademark applicant needs to respond. The trademark applicant then needs to respond to the office action with appropriate arguments and /or corrections within a time period specified in the office action. The trademark attorney at IP Legal Services handles all such trademark prosecution. steps in a timely manner. When all the requirements for registering the trademark in the US are successfully met, the U.S.PTO registers and publishes the trademark for opposition. IP Legal Services also files international trademark applications under the Madrid Protocol with the International Bureau, World Intellectual Property Office (WIPO), Geneva, Switzerland. An international trademark application is required to be based on a US basic trademark application or any foreign basic trademark application. The requirements for an international trademark application are basically the same for a basic US trademark application. However, a separate fee for the international trademark application is required to be paid to the International Bureau of the WIPO. For details on the Madrid Protocol see here. A declaration of bona fide or good faith use in commerce if the trademark or service mark is not yet commercially used. A trademark application can be filed with the U.S.PTO based on ownership of a foreign trademark application (if filed within six months of the foreign filing date) and ownership of foreign registration for the same trademark, either of which would require copies to support the same. The US trademark office requires payment of fees based on the number of classes of goods and/or services identified for the trademark or service mark and whether the reproduction of the trademark or service mark will be in black and white and/or in color. The US trademark office specifies several classes of goods and/or services associated with the goods or services sought to be trademarked. In order to avoid common trademark filing mistakes and to choose the right trademark, one must be aware of the rules and regulations of the US Patent And Trademark Office. For details read "Preventive Steps to Avoid Trademark Refusals - How to Choose the Right Trademark"